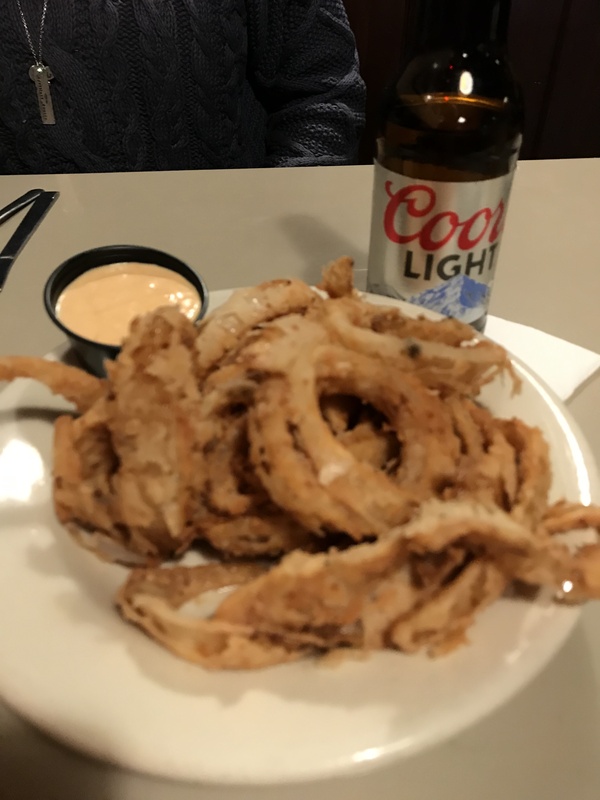 Washington D.C. may have Ben’s Chili Bowl, but Old Town Alexandria has Hard Times Café…so does Fairfax, Fredericksburg (2), Springfield, Rockville and College Park, Maryland. 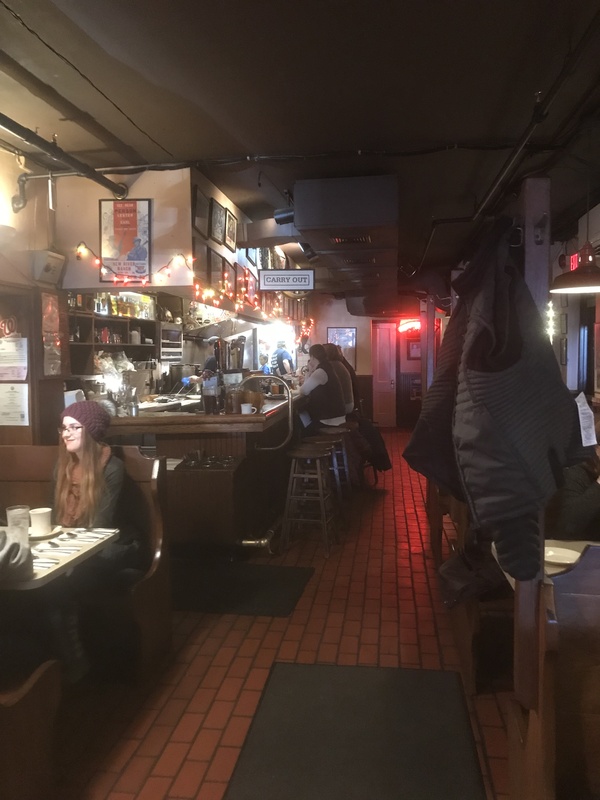 With winter finally here, we decided that a visit to Hard Times Café for some chili and a san dwich was a perfect fit for a cold day. Back when there were hardly any businesses in the west end of Old Town, brothers Fred and Jim Parker decided to take Fred’s passion for making chili out of his house and open a restaurant. They rented an old building in the 1400 block of King Street and opened in 1980. It was a bold step as there was not much foot traffic or many offices in that end of town, but the brothers forged ahead and opened their depression-era chili parlor. Now, 39 years later, that end of town has flourished and so has Hard Times. The initial recipe was handed down to Fred from his Aunt Irma, who had owned a successful chili parlor in Oklahoma. Fred’s other recipes are the result of research, experimentation and competition cooking at chili cookoffs around the country. As I remember, when Hard Times first opened all they had was their Texas Chili and some variations, a hot dog, and a hamburger that was flame broiled. Walking into Hard Times is like walking back in history. You might imagine yourself in an old western saloon. There is a bar in the back after you make your way past wooden booths. Everything is extremely casual, and the action moves fast. In the bar area is an old neon jukebox that plays old western tunes. Todays menu has grown considerably from the beginning. The appetizer list of 9 items include Chili Nachos, Corn Dog Nuggets, their famous Onion Rings, Deep Fried Pickles and Santa Fe Egg Rolls. They also offer Grilled Wings and Boneless Wings. Their chili recipes are authentic and historically correct versions of the chili created on the turn-of-the-century cattle drives of the Southwest and in the Cincinnati chili parlors of the Midwest. 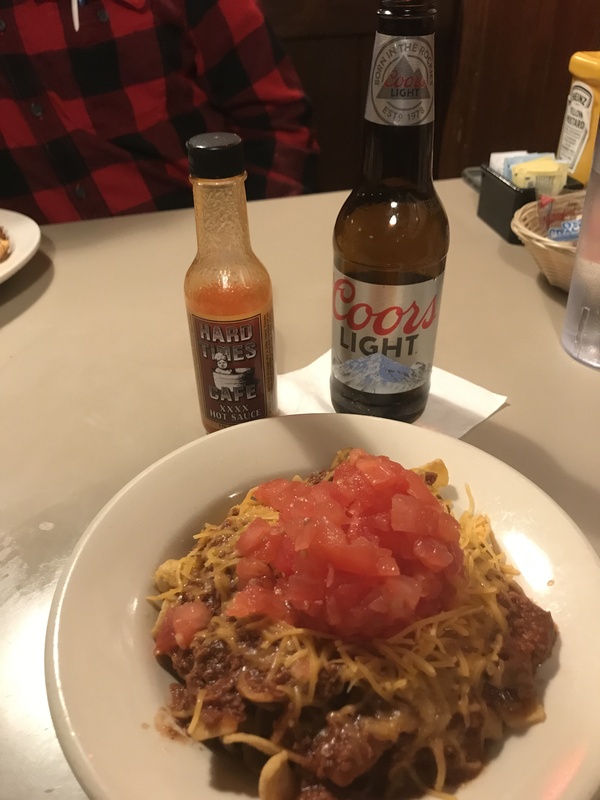 These include the original Texas Chili, Cincinnati Chili, Terlingua Red , a tribute to the Texas ghost town that hosted the first chili cook-off. A redder color and spicy kink of championship chilies. They also offer a Vegetarian Chili consisting of Soy flakes cooked in a tomato base with fresh mushrooms, onions, green peppers and jalapenos – this is one to choose if you want chili with a bit more of a kick. Their offerings of Chili Mac (chili over spaghetti) are 3-Way, spaghetti, chili and cheese, 4-way, add onions, 5-way, add onions and beans. Chili by the bowl is your choice of chili with or without beans. They also offer Chili Bubba and Frito Chili Pie. Hard Times offers 6 different burgers, three variations of sliders, chili dogs and seven sandwich choices. In addition, there are six salad offerings and four Suppertime Platters which include two sides. The four are Southwest Ribs, Chicken Tender dinner, Grilled Salmon and Fish & Chips. All dinners come with two sides and all are under $15. On our visit we first shared their famous onion rings. These were lightly breaded and deep fried. There was just enough breading to get the idea across but let the onion come through. For my lunch I picked one of their sandwiches…the Southern Fried Chicken Sandwich. I should have listened to Tony our waiter when he said that it is a big sandwich. The plump chicken breast was hand-battered, deep-fried, served on a toasted bun topped with bacon and jack cheese. This sandwich took me back to my boyhood days on my grandparent’s farm in Georgia and my grandmothers fried chicken. The only thing missing was sweet tea. Because of the onion rings I was unable to finish this sandwich, however it made for a tasty late-night snack the next night. My partner went straight for the Frito Chili Pie. While her normal order here is the chili mac 5 ways with fresh chopped jalapenos on the side, she changed out the spaghetti for the Fritos. This is sort of a high end version of a Taco John (not sure if there are any of these restaurants in our area) Chili Frito that was her old staple back home in Wyoming after a night of consuming more than one adult beverage. Only thing here is that you have to eat it sorta fast unless you are fond of soggy Fritos! We didn’t order corn bread this time but it is also some of the best around – we like it because it is on the sweet side. None of this would be complete without a cold beer and Hard Times has just that. A good selection of on tap and bottles without all of the now-popular “craft” beers taking over the bar. There is full bar service as well but I don’t think we have ordered anything but a beer in the over 30 years we’ve been coming here. Treat yourself to some hot chili these cold February days. 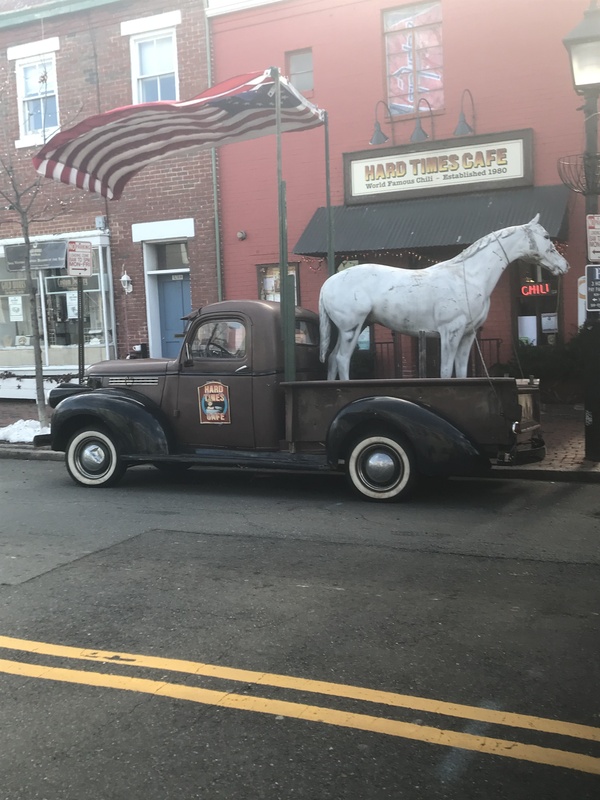 Hard Times Café is easy to find…just look for the 1941 Chevy pickup out front with a horse mannequin standing in the bed and Old Glory flying high.